As seasoned B-BBC readers are all too aware, the BBC has an unpleasant habit of editing elements of its stories, without changing the ‘last updated’ timestamp in the article header – an activity known as stealth editing. 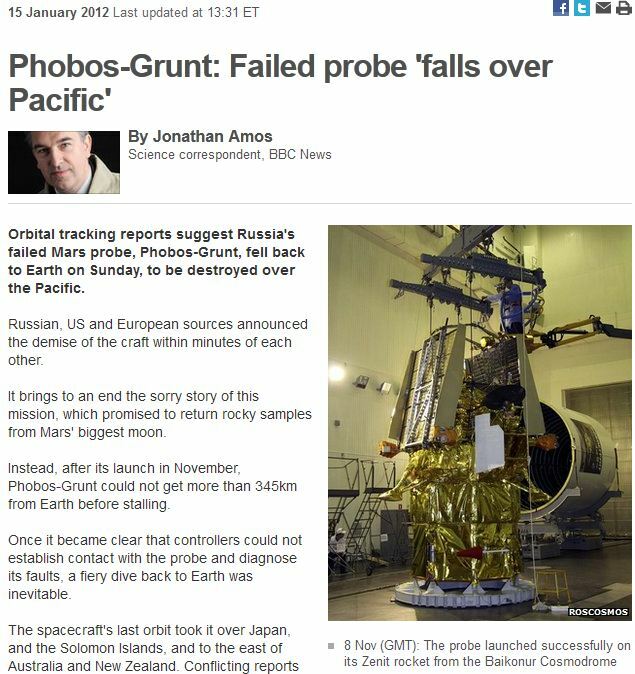 The corporation was at it again today in its coverage of the failed Russian mission to send a probe to Mars and return with material from the planet’s surface. The Phobos-Grunt launch saw the probe trapped in Earth orbit and gravity slowly bringing it back through the atmosphere. Today was the day the splashdown happened, and Auntie’s science correspondant, Jonathan Amos, made sure the write up contained suitably dramatic imagery to capture the spectacle of re-entry. 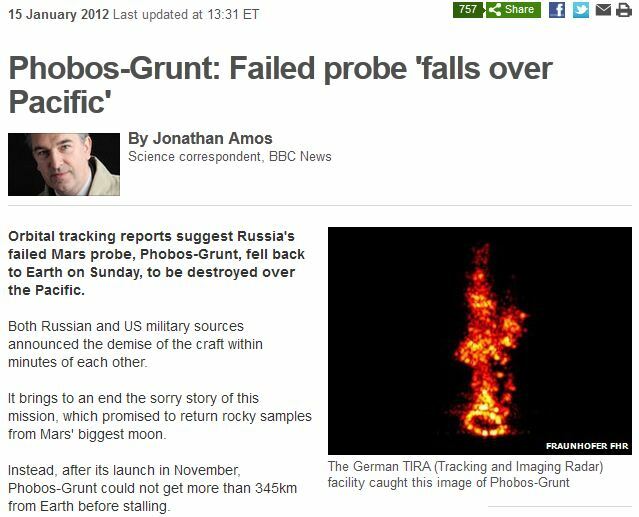 Only the image used was nothing to do with the re-entry and was a radar image with colouration added and it was taken five days ago. The Watts Up With That? blog highlighted the BBC’s sloppiness and explained how radar images are in fact colour-free. Sometime this afternoon, after WUWT published their blog posting, the BBC replaced the image on the story as you can see below. The sharp-eyed of you out there will notice that the BBC has tried to hide the alteration by not updating the ‘last updated’ timestamp. Yet again we have an example of stealth editing. In this case it is just a change of image. However, often it is the copy that is altered and at times it is done in a way that changes the emphasis or context of a story so the revised article reads very differently to the original. Is it just sloppy web management, or is it a case of, “Nothing to see here, we didn’t get anything wrong and correct it after a blog in the US highlighted our mistake”? Either way, it has created a niche for a website called News Sniffer which records many of the BBC’s article revisions for comparison purposes. It is a terrible indictment of the BBC that because of its stealth editing behaviour and habit of quietly tinkering with news articles, a resource like News Sniffer has become so important.